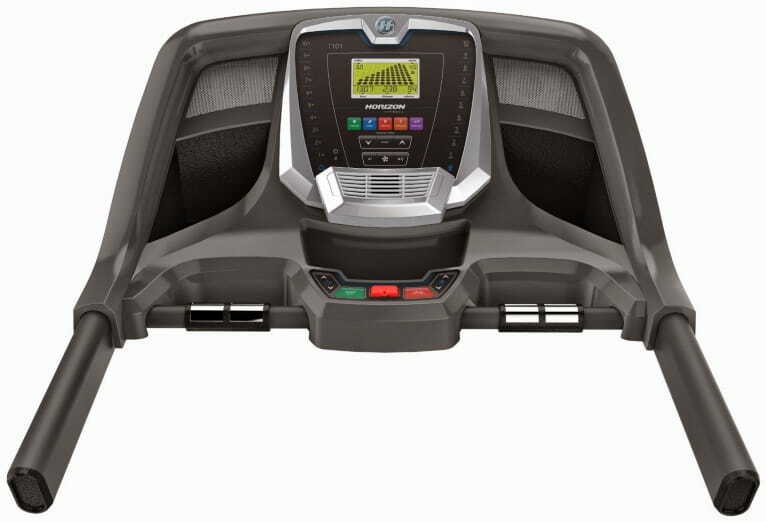 Whether you are starting a new fitness routine for your health or you want to be able to enjoy a long run late at night, without worrying about being out on the streets, the Horizon Fitness T101-04 Treadmill is worthy of a glance. It is actually deserves a lot more than just a glance; this is one we really like for a long list of reasons. There’s a long list of reasons to love the Horizon Fitness T101-04 and it’s in our top 3 best treadmills. How Does the Horizon Fitness T101-04 Work? This product has everything you need in a treadmill, and nothing you don’t. Unlike others that often make you feel like you are on a trampoline when you increase your pace beyond a certain point, this one doesn’t. It is sturdy, confident, and holds its composure when put to the sprinting test. Also, it manages to deliver whisper-quiet operation at all speeds, thanks to its 2.25 HP motor. Many treadmills accommodate a weight capacity up to 300 pounds, but they come with a surprising short deck. It is as if manufacturers forget that sometimes, a heavy weight does coincide with a significant height. This product was made for the tall runner, as it features a 55″ belt, which should be more than long enough for most. It is also cushioned nicely, so your run will have minimal impact on your back and joints. The Horizon Fitness T101-04 is equipped with 30 program options, including distance-based, step-goal, calorie-goal, and interval workouts. Of course, you can simply use the manual option to create your workout, if you prefer. It can operate at speeds up to 10 mph. It comes audio-ready, too, so you can plug in your iPod and enjoy music through the speakers, if you do not want to use your headphones. When it is not in use, simply fold it vertically, so it is out-of-the-way. It features two hydraulic shocks, making it effortless to fold and lower. What Are the Health Benefits of Using the Horizon Fitness T101-04? When you have a Horizon Fitness T101-04 in your home you have the power to enjoy a workout in a safe environment anytime you want. There will be no more excuses not to run because of snow storms or extreme heat, and you will not have to constantly look over your shoulder to see if there is anyone creeping up behind you, like you might if you were outside. Running improves cardiovascular health, slows down the aging process, and offers a number of psychological benefits. If weight loss is your goal, you will appreciate the six calorie-goal workouts. If you are training for a marathon, take advantage of the 10 distance-based workouts. If you already suffer from achy joints or you generally get a sore back running on the concrete outside, then you will appreciate the Flex Deck Cushioning. This feature allow you to enjoy a more comfortable workout. What Do Others Have to Say About It? What Else is There to Love? With 30 present programs, you can enjoy a different workout every day of the month. Optimal cushioning minimizes stress placed on the back, legs, and feet. The 2.25 CHP motor provides a smooth and quiet ride. Hydraulic folding technology allows you to effortlessly fold it vertically, so it is out-of-the-way. User-friendly interface is attractive to those not so tech-savvy. Sonic Surround speakers welcome your iPod or MP3 player. Generous weight capacity of 300 pounds. Long 55″ belt should accommodate the stride of most runners. Operates at speeds up to 10 mph. You are welcome to look for the Horizon Fitness T101-04 at local and online retailers, but we recommend Amazon for treadmill purchases. The site is secure, and dealing with customer service is always a positive experience. Not to mention, list price on this product is $829, but Amazon sells it for $629.99 and you get free shipping. There are treadmills that have more to offer gadget-wise on the market, but we love that this is a high quality treadmill that gives you a lot of bang for your buck. It does not have some of the frills that others boast, and it would be nice if it connected to iFit Live. However, we will trade luxury features for a product that is quiet and sturdy at high speeds any day. Plus, assembly is a breeze, and many people have it out of the box and ready to use within 30 minutes. Where Can I Read Reviews? To make an educated buying decision, it is always a good idea to read reviews created by folks just like you. You can read several reviews and learn more about this product right on Amazon. You will find that for the most part, folks have very positive things to say about the Horizon Fitness T101-04. Disclaimer: LiveLongerRunning.com works in affiliation with online merchants. All prices displayed on this site are subject to change without notice. Although we do our best to keep all links up to date and valid on a daily basis, LiveLongerRunning.com cannot guarantee the accuracy of links and special offers displayed. We are not responsible for any products ordered from our affiliate merchants and we cannot be held responsible for any actions of our affiliated merchants. This site receives compensation for referred sales of some or all mentioned products.